Movie & FX - original sound programs specially designed for film scoring and soundtrack projects (experimental pads, strings, voices, organs, pianos and synth effects). In addition to this, Kurzweil K2xxx ROM and FARM "Movie & FX" sound programs, newly sorted and well organized by Art of Sound to achieve easier access and use, have been added free of charge as a bonus. Info: All original K:Works sound programs use internal Kurzweil K2600 ROM samples exclusively, there are no external samples used. Note: This soundware collection is designed for Kurzweil K2600/K2600R synthesizers with Contemporary and Orchestral optional ROM boards installed. 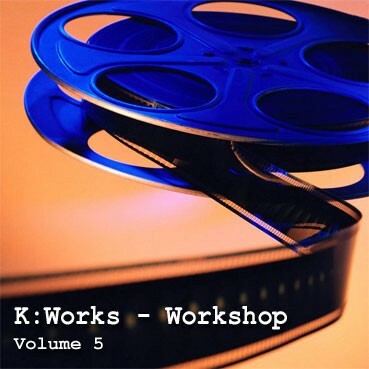 For the K:Works - Workshop - Volume 5 "LE" version designed for Kurzweil K2600/2600R synthesizers without optional ROM boards installed, please click here. Soundware delivery info: The ordered product will be delivered to your e-mail address as a ZIP file. The K:Works collections are available as "EX" and "LE“ versions. The K:Works "EX" version is designed for Kurzweil K2600/2600R synthesizers with Contemporary and Orchestral optional ROM boards installed. The K:Works "LE" version is designed for Kurzweil K2600/2600R synthesizers without optional ROM boards installed.